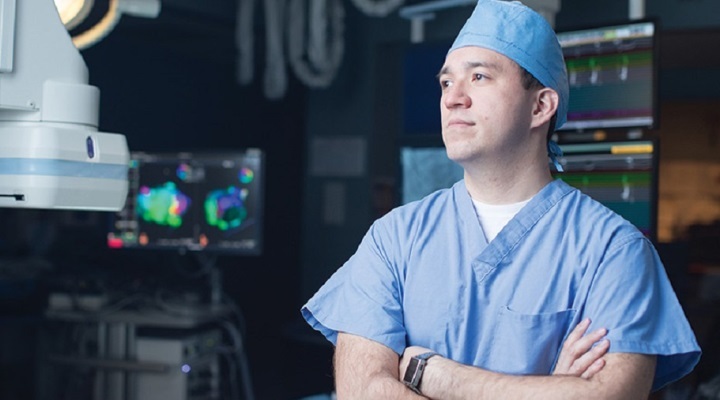 Spearheading the pursuit of cutting-edge technologies and mastering the latest techniques in his field, Dr. Allen Amorn, Cardiac Electrophysiology Specialist, brings the strength of his passion for his chosen profession. A Cardiac Electrophysiologist is a doctor who monitors the electrical impulses of the heart. This is a specialty that takes more education than most in the medical field and a doctor who achieves this level of training is uniquely equipped to help many when other areas have failed. Dr. Allen Amorn is a doctor with the drive and compassion to accomplish this and benefit his patients. The extensive education for this talented physician began at Youngstown State University, in Youngstown Ohio. Here, Allen Amorn was in a combined program with Northeast Ohio Medical University. After three years at Youngstown he received a bachelors of science, he then transitioned to Northeast Ohio Medical University for his medical degree. Once that was completed, he applied to and was accepted by Cedars-Sinai Medical Center in Los Angeles, California for his residency. His residency at Cedars-Sinai was followed by a fellowship with Kaiser Permanente, focusing on cardiology. Dr. Allen Amorn’s focused Cardiac Electrophysiology education and practice brought him back to Cedars-Sinai. This is where Dr. Allen Amorn was able to begin his path in the field he had fallen in love with. In time, Dr. Allen Amorn returned with the new skills to Ohio where he began a thriving career, helping others and paving the way to new technologies and assets for his patients. His desire to provide the best possible outcome for every patient who enters his office continues to drive him to learn and better the experience. His goal is to ensure the health and wellbeing for every individual he encounters. I became a doctor because at a very young age, I was able to see how important it was to be a doctor. I had a unique perspective about the life of a doctor since my father was also a doctor. I saw how his unique ability and skills allowed him to help his patients, sometimes at the most desperate hour. It really inspired me to help people in the same way. People literally trust you with their lives when they are the most vulnerable. The ability to gain their trust and deliver something life-saving is one of the most rewarding sensations ever and I’ve always enjoyed the work that I do. What made you choose to specialize in Cardiac Electrophysiology Specialist? Cardiac Electrophysiology is a subspecialty of Cardiology. We are known as the “electricians of the heart”. It takes additional training after becoming a cardiologist. We treat heart rhythm problems, such as skipping heartbeats, fainting, or unusually fast or slow heartbeats. I perform procedures such as catheterization ablation, or pacemaker defibrillator implantation. As well as medical management of cardiac rhythm issues. My daily routine will vary widely. Some days I see patients in the clinic all day and adjust medications or schedule out-patient procedures. Other days I will be exclusively performing these procedures that were previously scheduled. There are days when I will be seeing new patients in the hospital and performing any urgent or necessary procedures for them that same day. When you look forward in your career what trend in medicine do you see impacting your specialty the most. Is it for better or worse? Why? One of the areas that have become most interesting within the medical industry, and especially within the field of Cardiac Electrophysiology is the utilization of Artificial Intelligence (A.I.). It is a brand-new endeavor. I think it will dramatically revolutionize some parts of what I do and some parts of what all physicians do for the better in the future. The most current applications for utilization of A.I. and deep learning machines include such things as (EKG) electrocardiogram interpretations. The group out of the Mayo Clinic has recently published information with regard to using deep machine learning or A.I. to help the accuracy of both EKG diagnosis, as well as making diagnoses that could never have been made previously from a test as simple as the EKG. Many people are afraid that this technology may replace physicians. I am not of that mindset. I believe it will enhance what we do. I think the only difference in the future will be from those physicians who embrace the technology and those who chose not to. I think that many physicians share the same love for what we do. We love to see patients get better and live active lives. In my field, however, that can be somewhat unique. Beyond the typical medication adjustment, which can dramatically improve someone’s quality of life, we have the unique opportunity in cardiac electrophysiology to extend lives and even cure diseases. Most medical fields are excellent at treating or managing diseases. But in my field, we can perform a one to two-hour catheter ablation procedure and cure a problem that the patient could have been suffering with for years or even decades. These opportunities are unique and bring great professional satisfaction. Additionally, pacemakers and defibrillators can provide life-saving therapies as well as add to the quality of life. These benefits cannot be gained with medications alone. The relatively unique treatment modalities that I’ve been able to bring to each practice that I have worked with has been a tremendous accomplishment. Many locations around the world and even in the United States don’t have access to some of the latest technologies and techniques in the arena of cardiology. Bringing these new therapies can mean bringing hundreds of thousands of people can have local access to treatments that they use to have to travel many hours to receive. One very special case was of a woman who was treated at several high-profile academic centers. She was being treated for a problem called Wolff-Parkinson-White (WPW) syndrome. Despite these prior centers’ best efforts, she continued to suffer from these symptoms. My partner and I performed the catheter ablation several years ago. Now she is cured of her condition. I have a wonderful family. I have a beautiful wife and three great boys. My time spent with them is my most valued possession. I enjoy golf as well as playing the piano. I also like to exercise. I practice yoga and meditation. I strongly believe that in a field that is so mentally taxing, that respite is critical and sometimes unappreciated for its need to physicians. I believe I will be doing much of what I am doing today. I will be providing cutting edge innovative care to all of the patients that I see and treat. Having a close patient-physician relationship is the lifeblood of the healthcare industry. Although there are many things that try to get in the way of that relationship, I think we as physicians have to find a way to hold strong as to how that relationship is both now and in the future. I would say that my practice style is patient-centric and holistic. Too often patients feel like a cog in a machine or just a number. This is especially true as practices become more business oriented. I strongly believe that the patient needs to be an informed consumer. I see my job, not as the old-style physician who just tells the patient, this is what you get. Too often these days patients are treated just like that. We have to use shared decision making with our patients, to make sure their decisions are held with the highest regard. Of course, in situations of life or death, the options are much more limited. Which is when we have to help our patients to make the correct choice. However, for situations that are improving symptoms only, and are not likely to extend their lives, then I believe patient input is critical. This could mean a much longer visit with much more information to process. At the end of the day, patients are in charge of their own health. We as physicians are a guide to good health.